Some have been better than others, but most have simply been great to watch. The writing, the art, the imagination … extraordinary. The actors these movies have managed to get together … spectacular. And with the recent success of “Toy Story 3,” it is safe to say they are not going anywhere. Though for a moment there — like my brother pointed out to me — these seemed to all have similar plots, where an unlikely character (a bug, a toy, a monster, a robot, etc) becomes an unlikely hero. But with “Up” and “Wall-E,” it became evident this plot can still be fresh, enjoyable and bankable. Art-wise, there are still some movies that pay more attention to detail than others. For me, “Ratatouille” is still the most detailed of these computer-generated masterpieces. Conversely, the art in “Hoodwinked” was terrible, yet the movie was incredible enjoyable for me. Of course, many are probably wondering how I can say the art in “Ratatouille” is better than that of “Toy Story 3.” I think “Toy Story 3” actually hit a new milestone in art — that’s how good it was — but with “Ratatouille,” my eyes seemed to be taken to a museum of magnificence. This brings us to “Rango,” starring Johnny Depp. It is possible this is a recycled plot from a “Bugs Life,” but it is hard to say this soon. I won’t lie, this movie didn’t appeal to me from the moment I heard of it and saw short clips of it. But, once again, researching a movie for an article has sparked my interest in a project. I am highly impressed with the cast and the art … very impressed. Make no mistake, Johnny Depp isn’t the only big star in “Rango.” It also features Isla Fisher, Abigail Breslin, Ned Beatty, Alfred Molina and Timothy Olyphant. That, my friends, is an amazing cast. Sounds a bit Clint Eastwood-ish to me, but it might just work. After watching the clips below, I am impressed. If this was a live-action movie, I would say it was filmed with the IMAX camera. That’s how detailed, crisp and beautiful I found what I saw in these clips. You must watch them. They show us some great fun moments in the film without giving away any of the plot (genius). Check them out and let me know if your eyes are as enlivened as mine were. 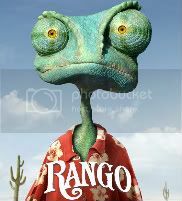 “Rango” was directed by Gore Verbinski (“Pirates of the Carribean”) and will hit theaters on March 4.